Steven Haworth (born 23 January 1976), better known by his ring name Nigel McGuinness, is an English professional wrestling commentator and former professional wrestler. He is currently signed to WWE as a colour commentator for 205 Live, NXT, NXT UK and Main Event. As a wrestler, he is perhaps best known for his tenure with Ring of Honor (ROH) in the United States and Pro Wrestling Noah in Japan. He held the ROH Pure Championship for a record 350 days and is a former ROH World Champion, holding the title for 545 days. From October 2009 to June 2011, Haworth wrestled for Total Nonstop Action Wrestling under the ring name Desmond Wolfe. This was his last run as an in-ring performer. He returned to ROH in August 2011 as a colour commentator, and retired from in-ring performing on 17 December 2011. He left ROH in December 2016 and signed with WWE soon after, working as a commentator. Steven Haworth was born in London on 23 January 1976. He grew up in Staplehurst, Kent, where he attended Maidstone Grammar School. He was a wrestling fan from the age of 12, particularly enjoying The Hart Foundation and British Bulldogs, and attended SummerSlam in 1992 while wearing The Ultimate Warrior face paint. He studied at the University of Leicester in the 1990s and spent a sandwich year at Kent State University in Kent, Ohio, graduating in 1997 with a 2:1 degree in chemistry. In September 1998, Haworth began training under Les Thatcher in the Heartland Wrestling Association (HWA) in Cincinnati, Ohio, incurring large debts in the process. After debuting in September 1999, working under the ring name Nigel McGuinness and defeating GQ Masters III in a match that was featured on ABC's 20/20, he spent a year wrestling in the mid west. Haworth returned to England where he worked two full-time jobs to earn enough money to be able to return to the United States to wrestle, and wrestled for All Star promotions between September and December 2001, where he learned from wrestlers such as Robbie Brookside. McGuinness developed a heel character which he described as "a punk rock soccer hooligan... Billy Idol meets Johnny Saint". On 10 July 2001, McGuinness defeated Dean Jablonski in a singles match with the HWA Tag Team Championship on the line (the co-holder of the title, Chet Jablonski, was indisposed), claiming the title for himself and his partner, The Human Time Bomb. McGuinness and The Bomb held the title until 7 August, when the Jablonski brothers regained the title. McGuinness and The Bomb would become champions for a second time on 23 July 2002, defeating the Jablonski brothers once more. They lost the title to Southern Breeze later that year. In 2003, McGuinness introduced the HWA European Championship to HWA. He held the title until 30 September 2003, when he lost to Hoss. He regained the title on 4 November and promptly retired it. 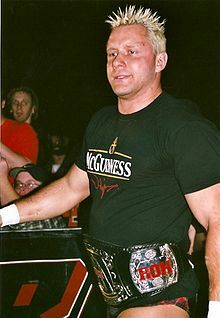 McGuinness won the HWA Heavyweight Championship on 6 September 2003 in Batavia, Ohio, defeating Chad Collyer, He held the title until 3 January 2004, when he lost the title to Hoss. McGuinness defeated Hoss to begin a second reign with the title on 6 January, and held it until 17 March 2004, when he lost to El Temor. McGuinness debuted in Ring of Honor (ROH) on 9 August 2003, defeating Chet Jablonski. He wrestled for ROH throughout 2004, but had limited success. In March 2005, McGuinness and Colt Cabana teamed together to challenge for the ROH Tag Team Championship, but lost to the incumbents, Dan Maff and B.J. Whitmer. Cabana and McGuinness then began fighting one another, with McGuinness defeating Cabana on 7 May 2005, with an accidental low blow for a shot at the ROH Pure Championship. He challenged the champion, Samoa Joe, on 12 June 2005, but was defeated. He faced Joe once more on 27 August, and defeated him to win the Pure Championship. After becoming champion, McGuinness turned heel and for several months was engaged in a feud with Claudio Castagnoli, instigated by a non-title match on 14 October where Castagnoli was able to use his knowledge of McGuinness's European wrestling style to score a pinfall on the champion. This led to a series of matches for the title, with McGuinness using underhanded tactics to avoid losing the championship belt. On 25 March 2006, McGuinness defeated Castagnoli in a match billed as the latter's last chance to win the championship as long as McGuinness was champion. During his Pure Championship run, McGuinness regularly carried an iron (decorated with the Union Jack) to ringside. When asked, the typical story given was that a group of men once broke into his home to attack him, but he was able to defend himself with the iron. In reality, he began carrying the iron after a girlfriend's mother asked him why some wrestlers carried weapons to ringside, and then inquired as to whether anyone had ever carried an iron before. He would often use the iron as a weapon to win his matches. McGuinness also had a malapropistic gimmick in ROH of mispronouncing words. An example would be at Survival of the Fittest 2005 in Dorchester, Massachusetts, when he said the fans appreciated him as much as "their beloved Boston Red Stockings". During the rest of 2006, McGuinness was mostly uninvolved in the war between ROH and Combat Zone Wrestling (CZW), instead developing a new gimmick where he would win his matches by countout by using (often unfair) methods of preventing opponents from returning to the ring. McGuinness received a shot at the ROH World Championship against Bryan Danielson with his own Pure Championship on the line and contested under pure wrestling rules on 29 April. McGuinness again won by countout, by which only the Pure title could be won, but not Danielson's World title. The victory was enough to earn a rematch under regular rules on 29 July, in which Danielson narrowly managed to retain his title. A month later in Liverpool, England, ROH arranged a unification match between the two titles and guaranteed there would be a winner, with both titles able to change hands due to countout or disqualification under pure wrestling rules. McGuinness lost the match on 12 August and the Pure Championship was unified and retired. McGuinness reign of 350 days is the longest in the two-year history of the Pure Championship. After the match, Danielson offered McGuinness one more shot at the unified ROH World Championship and on 25 August the two of them wrestled a two-out-of-three-falls match to a 60-minute time limit and as a result McGuinness could no longer challenge for the title as long as Danielson was the champion. After the match, Danielson recognised McGuinness' efforts and gave him the now retired Pure Championship belt as a trophy. After losing the Pure Championship, McGuinness, now a face, challenged for Pro Wrestling Noah's GHC Heavyweight Championship on 16 September 2006, at ROH's Glory by Honor V – Night 2, but was defeated by the defending champion Naomichi Marufuji. The rest of the year saw McGuinness feuding with Jimmy Rave, who, using his new submission manoeuvre, the Heel Hook (a single leg Boston crab and twisting ankle lock combination), forced him to tap out on two separate occasions, first on 8 December 2006, at The Chicago Spectacular Night 1 and then on 23 December 2006, at Final Battle 2006. Rave followed that up with another victory over McGuinness on 27 January 2007, this time in an "I Quit" match, which he won via referee stoppage. In February, McGuinness began acting as a representative of NOAH and as a spokesperson and tag team partner of NOAH talent Takeshi Morishima, upon his arrival to the company. On 4 March in Liverpool, McGuinness ended his feud with Jimmy Rave by defeating him with a Rebound Lariat, which in storyline resulted in Rave suffering a broken jaw and earned the move the new name of Jawbreaker Lariat, when in reality Rave had broken his jaw a month earlier. McGuinness' next feud would be with Chris Hero, who had dubbed himself the best pure wrestler in the world. During this feud McGuinness also received two shots at the ROH World Championship, on 14 April and 16 July, but was both times defeated by champion Takeshi Morishima. On 23 June, McGuinness defeated Hero in a 30-minute time limit match, but Hero came back on 10 August and defeated McGuinness with help from his agent Larry Sweeney and the Sweet 'n' Sour Inc. in a match contested under pure wrestling rules. On 15 September 2007, at Man Up, ROH's third pay-per-view, McGuinness defeated Chris Hero, Claudio Castagnoli and Naomichi Marufuji in a four-way match to earn one more shot at Takeshi Morishima's ROH World Championship, which McGuinness won at Undeniable on 6 October 2007. In late 2007, ROH confirmed that McGuinness had suffered a torn biceps and would be out of action until Final Battle 2007, however he would not be stripped of the ROH World Championship. On 2 November, the first night of ROH's Glory by Honor VI event in Philadelphia, Chris Hero and his agent Larry Sweeney complained of McGuinness' injury, calling him a fluke champion. Sweeney felt that Hero's victory of the Survival of the Fittest in Las Vegas earned him a title shot any time he wanted. McGuinness, in street clothes, accepted the challenge. He successfully retained the title against Hero, despite first losing the match due to the referee failing to notice McGuinness' foot on the rope while Hero made him tap out to submission. On 29 December 2007, McGuinness returned to the ring full-time at ROH fifth pay-per-view, Rising Above. During his defence of the ROH World Championship against Austin Aries, however, McGuinness injured his head when Aries dove from the ring onto him, which resulted in him hitting his head on the metal guard rail. The impact gave McGuinness a concussion, broke his nose, opened his eyebrow, and required 14 stitches. On 25 January 2008, McGuinness wrapped up his feud with Chris Hero by successfully defending his title against him in a steel cage match. In February at ROH's Sixth Anniversary Show, McGuinness turned heel during his successful title defence against Bryan Danielson by breaking an earlier agreement and targeting his head, injured earlier at the hands of Morishima. Throughout the rest of the year, McGuinness successfully defended his title against the likes of Tyler Black, Austin Aries, Kevin Steen, Claudio Castagnoli, Go Shiozaki, Jerry Lynn, Roderick Strong, El Generico and on 22 November 2008, at Rising Above, in a grudge match against Bryan Danielson. On 20 March 2009, McGuinness sustained an arm injury competing in a tag team match. However, despite the injury reportedly requiring surgery, he still wrestled at the Seventh Anniversary Show the next night and defeated KENTA to retain his title. Finally, on 3 April 2009 at Supercard of Honor IV, McGuinness lost the ROH World Championship to Jerry Lynn at his 39th defence, ending his reign at 545 days. After a hiatus to recover from the injury, McGuinness returned to wrestling a few months later. On 24 July, McGuinness suffered a minor injury during a four-way match after his "spine got compacted taking a piledriver", and was unable to wrestle the following night. On 4 September, ROH announced that McGuinness had "in principle" agreed to a contract with World Wrestling Entertainment (WWE), but confirmed that he would continue to wrestle for ROH until the end of September. McGuinness wrestled his last ROH match on 26 September at Glory by Honor VIII: The Final Countdown, losing to Bryan Danielson, who was also making his final appearance for the company. While still in ROH, McGuinness continued to compete in various other independent promotions like IWA Mid-South, New Era Pro Wrestling, Italian Championship Wrestling, and American All-Star Wrestling, as well as tours in various countries. McGuinness would also make appearances for some major promotions. On 11 August 2004, McGuinness appeared in Total Nonstop Action Wrestling (TNA), debuting in a 22-man Gauntlet for the Gold for the TNA X Division Championship, which was won by Petey Williams. On 31 August 2005, McGuinness competed in Ohio Valley Wrestling, WWE's developmental territory, on episode of its OVW TV, losing to Elijah Burke. He would go on to wrestle Danny Basham on 11 September 2005, episode of Sunday Night Heat, taped prior to Raw on 5 September, losing after Basham hit an inverted DDT. On 13 November 2005, McGuinness returned to TNA at the pre-show prior to the Genesis pay-per-view in a losing effort to Shark Boy, before leaving America to tour Japan with NOAH in November and December 2005. He wrestled nine matches in total, seven of which he won, and teamed with fellow gaijin Doug Williams, 2 Cold Scorpio and Bison Smith. 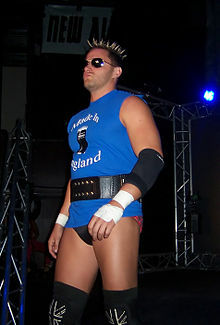 During his tour of Japan, McGuinness was supposed to compete in TNA's 2006 World X Cup Tournament, but Team UK was replaced by Team Canada, after McGuinness and Williams could not appear because both were booked in Japan. 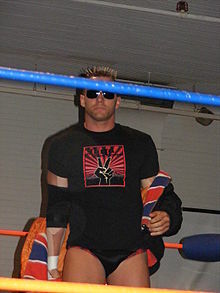 In 2007, McGuinness represented ROH in the King of Europe Cup. He made his way through to the final and, in his home country, defeated fellow Brit and tag-team partner Doug Williams to win the 2007 tournament final. On 14 October 2007, McGuiness wrestled James Tighe in the first round of the British National Championship held by International Pro Wrestling: United Kingdom (IPW:UK), however McGuiness was disqualified for the use of brass knuckles and eliminated from the tournament. McGuinness won the 1PW Openweight Championship, his first title in a British promotion, on 19 April 2009, by defeating Johnny Moss. On 4 September 2009, ROH announced that Haworth had agreed to a contract with the WWE "in principle". On 20 October 2009, it was reported that Haworth's deal with the WWE had fallen through due to him failing a pre-screening physical test after feeling an old biceps injury needed surgery and that he had decided to sign with TNA instead. He officially made his TNA return as a heel under the ring name Desmond Wolfe on 22 October episode of Impact! by attacking Kurt Angle. The following week, Wolfe defeated Angle in a street fight via referee stoppage, following a lariat. On 12 November, Wolfe won a third exchange with Angle as he laid him out with a DDT. At Turning Point, Angle defeated Wolfe via submission. The following month at Final Resolution, Wolfe faced Angle in a "Three Degrees of Pain" two-out-of-three-falls match. Wolfe managed to gain the first fall by pinning Angle following the Tower of London, but tapped out to the ankle lock in the second fall to make it even. In the final fall, which could only be won by escaping the cage, Angle managed to escape first and won the match and the feud. Fourtune hopefuls: (from left to right) Wolfe, Robert Roode, A.J. Styles, and James Storm. Following the loss to Angle, Wolfe moved on to feuding with D'Angelo Dinero, who defeated him on 4 January 2010, three-hour, Monday night episode of Impact!. At Genesis, Wolfe debuted a new valet, who was later named Chelsea, and defeated Dinero in a rematch. At Against All Odds, Wolfe entered the 8 Card Stud Tournament to crown a new number one contender to the TNA World Heavyweight Championship, but was defeated in the first round by the evantual winner of the whole tournament, Dinero. On 25 February episode of Impact!, Wolfe aligned himself with Ric Flair and then TNA World Heavyweight Champion A.J. Styles in their battle with Hulk Hogan, Abyss and D'Angelo Dinero. On 4 March episode of Impact!, Wolfe received his first shot at the TNA World Heavyweight Championship, held by Styles, in a four-way match, which also included Dinero and Abyss, but Styles was able to retain his title by defeating Dinero via referee stoppage. The following week on Impact!, Wolfe and Dinero were scheduled to once again face each other, but the match was cancelled after Wolfe attacked Dinero during an interview and re-injured his ankle. Wolfe and Dinero finally had their fourth singles match together on 29 March episode of Impact!, and this time Wolfe was able to pin the number one contender after hitting him with a chain, while Chelsea was distracting the referee, but on the following episode of Impact! Dinero defeated Wolfe in a rematch in just two minutes. At Lockdown, along with Sting, Robert Roode and James Storm, Wolfe represented Team Flair in the annual Lethal Lockdown match, where they were defeated by Team Hogan (Abyss, Jeff Jarrett, Rob Van Dam and Jeff Hardy), when Abyss pinned Wolfe. On 26 April, TNA introduced a new "Championship Ranking" system, where fans were allowed to vote on the number one contender to the TNA World Heavyweight Championship. Surprisingly, Wolfe led the first poll from start to finish, ahead of the likes of Jeff Hardy, Mr. Anderson, Sting, A.J. Styles, Kurt Angle, D'Angelo Dinero and Abyss, and on 3 May episode of Impact! was granted a shot at the title, held by Rob Van Dam. However, Wolfe was defeated in the title match. At Sacrifice, Wolfe was defeated by Abyss, who as a result won Chelsea's services for 30 days. On the following episode of Impact!, Chelsea started showing sympathy towards Abyss, when he was being brutalised by Wolfe. The following month at Slammiversary VIII, Wolfe was defeated by Abyss in a Monster's Ball match, when Chelsea turned on him and helped Abyss pick up the victory. On the following episode of Impact!, Ric Flair, who had aligned himself with Wolfe, Styles, Roode, Storm and Kazarian, announced that he would reform the Four Horsemen under the new name Fourtune, stating that each of them would have to earn their spots in the group and that in order for Wolfe to earn his spot, he needed to become the Lex Luger of the group. Later in the night, Chelsea reluctantly returned to Wolfe after her 30 days with Abyss were up. Wolfe gave her a chance to redeem herself, but her behaviour outside the ring provided a distraction, which cost Wolfe his match against Flair's nemesis Jay Lethal. After a series of losses, Wolfe attempted to get back in good graces with Flair by helping Styles and Kazarian defeat Samoa Joe and Rob Terry at Victory Road to earn their spots in Fourtune, only to get a muscle buster from Joe after the match. On the following episode of Impact!, Wolfe confronted Flair when he inducted Styles and Kazarian into Fourtune, demanding to be included in the stable. Two weeks later on Impact!, Flair revealed Robert Roode and James Storm as the final two members of Fourtune, leaving Wolfe out of the stable. After failing to make it into Fourtune, Wolfe went on to form a tag team with fellow Briton Magnus and together the two not only ended Wolfe's losing streak, but also started a winning streak, defeating teams like Amazing Red and Suicide, Hernandez and Rob Terry and Ink Inc. (Jesse Neal and Shannon Moore) on episodes of Xplosion, and in the process earned themselves the right to challenge for the TNA World Tag Team Championship. On 26 August episode of Impact!, the team was named London Brawling. They were scheduled to receive their shot at The Motor City Machine Guns (Alex Shelley and Chris Sabin) and the TNA World Tag Team Championship at No Surrender, but were at the last minute pulled from the event, with TNA citing a "personal issue" as the reason. It was later reported that Wolfe was pulled from the event due to an undisclosed medical situation that would sideline him for the next few months. On a December 2014 podcast, McGuinness revealed that at this time, he tested positive for Hepatitis B.
On-screen his absence was explained by Magnus, who claimed that in an attempt to become a dual athlete, Wolfe had travelled to London to try out for Chelsea F.C. On 21 November 2010, TNA president Dixie Carter announced that Wolfe was close to a comeback. On the 16 December episode of Impact!, Magnus met his former tag team partner Doug Williams and informed him that Wolfe was now done with football and would be coming back soon, while also telling him that they had gotten rid of Chelsea. Wolfe finally made his return in a non-televised segment on 10 December 2010, at the tapings of the 6 January 2011, episode of Impact!, when he and Magnus saved Williams from Fortune members A.J. Styles and Rob Terry. On 16 May 2011, Wolfe made his return to TNA, when he was announced as the new commissioner of Xplosion, turning face in the process. During his time as the commissioner, Wolfe also served as the third member of the Xplosion announcing team, working beside Jeremy Borash and Taz. However, on 17 June it was reported that Wolfe had been released from his TNA contract. 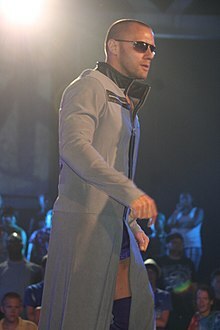 On 13 August 2011, Haworth, returning to his Nigel McGuinness ring name, returned to ROH at the promotion's first Ring of Honor Wrestling tapings under the Sinclair Broadcast Group banner, working as the colour commentator beside Kevin Kelly. The tapings concluded with McGuinness saving Eddie Edwards from the House of Truth. At the 3 November 2012, tapings of Ring of Honor Wrestling, McGuinness was named the new "Matchmaker" of Ring of Honor, replacing Jim Cornette as the main on-screen authority figure. In December 2012, McGuinness released a documentary titled The Last of McGuinness on his final days as an in-ring performer, during which he revealed that WWE had rescinded his contract after feeling an old biceps injury needed surgery, while his in-ring career in TNA ended after contracting hepatitis B during his time there. In late May 2013, McGuinness toured the United Kingdom with the shorter final cut of his documentary and has become an advocate for hepatitis B vaccination and an end to the use of intentional blood loss in wrestling. In 2014, following the success of his documentary, McGuinness began working in the film industry as an Assistant Editor and Production Assistant on various television shows and in December of that year launched a Kickstart campaign for his new creative project, L.A. Fights, described as a scripted show about "a diverse group of amateur fighters and their morally ambivalent promoter struggle to coexist in their upstart fight league". In December 2016, ROH announced McGuinness had resigned as the promotion's matchmaker. After being recommended by WWE lead commentator Michael Cole, on 15 December 2016, WWE announced that McGuinness had signed with the company as a commentator. McGuinness made his commentary debut at the WWE United Kingdom Championship Tournament on 14 and 15 January 2017, alongside Michael Cole. McGuinness became a colour commentator for NXT on the 8 February episode, establishing himself as a "heel sympathizer". On 4 September, McGuinness joined the 205 Live and Main Event commentary teams. In 2019 WWE released a documentary on McGuinness' career entitled Chasing the Magic: The Nigel McGuinness Story on the WWE Network, that covered his full career from his early childhood fandom of wrestling to his success as a commentator for the company. Haworth has a daughter, born in April 2018. ^ a b c d e f g h i j k l m n o p q r s t u v w x y z aa ab ac ad ae af ag "Online World of Wrestling". Online World of Wrestling. Retrieved 20 October 2009. ^ a b c "Desmond Wolfe". Total Nonstop Action Wrestling. Archived from the original on 31 May 2011. Retrieved 19 January 2010. ^ a b "Cagematch profile". Cagematch. Retrieved 19 January 2010. ^ Aldren, Mike (5 September 2009). "Daily wrestling news & gossip". The Sun. Retrieved 20 November 2009. ^ a b "Nigel's blog". NigelWrestling.com. 19 December 2011. Retrieved 26 December 2011. ^ a b c Clevett, Jason (27 February 2007). "Nigel McGuinness in it to win it". Slam! Sports. Canadian Online Explorer. Retrieved 20 April 2011. ^ "Nigel McGuinness". Internet Wrestling Database. Retrieved 6 December 2012. ^ "Duo get to grips with world's best grapplers". Kent News. 30 August 2008. Retrieved 20 April 2011. ^ "Nigel McGuinness Interview from Powerslam Magazine". Retrieved 23 March 2019. ^ "16 Carat Gold Tournament: Nigel McGuinness" (in German). Daniel Hill. Retrieved 14 March 2009. ^ "Ring of Honor – Wrath of the Racket". Online World of Wrestling. Retrieved 30 March 2010. ^ a b c "Ring of Honor Pure Championship". Ring of Honor. Archived from the original on 4 April 2010. Retrieved 5 April 2010. ^ DeRosenroll, Mike (26 September 2009). "ROH History: Classic Feud – History of Nigel McGuinness vs. Bryan Danielson". PWTorch. Retrieved 15 November 2010. ^ Ziegler, Jacob; Garoon, Brad (13 November 2006). "ROH – Unified DVD Review". 411Mania. Retrieved 30 March 2010. ^ a b Ziegler, Jacob; Garoon, Brad (5 December 2007). "ROH – Epic Encounter II DVD Review". 411Mania. Retrieved 30 March 2010. ^ Ziegler, Jacob; Garoon, Brad (14 May 2007). "ROH – Fifth Year Festival: NYC DVD Review". 411Mania. Retrieved 30 March 2010. ^ Ziegler, Jacob; Garoon, Brad (3 July 2007). "ROH – Fifth Year Festival: Finale DVD Review". 411Mania. Retrieved 30 March 2010. ^ a b c "Ring of Honor Title". Ring of Honor. Archived from the original on 12 April 2010. Retrieved 5 April 2010. ^ Dunn, J.D. (8 February 2008). "Dark Pegasus Video Review: Ring of Honor — Glory By Honor VI, Night One". 411Mania. Retrieved 30 March 2010. ^ Csonka, Larry (7 March 2008). "411's Ring of Honor Rising Above Report 3.07.08". 411Mania. Retrieved 30 March 2010. ^ Dunn, J.D. (28 April 2008). "Dark Pegasus Video Review: Ring of Honor — Sixth Anniversary Show". 411Mania. Retrieved 30 March 2010. ^ Gray, Richard (22 March 2009). "Report: Nigel McGuinness Suffers Serious Arm Injury, Larry Sweeney Suspended". Wrestling Observer. Wrestling News World. Retrieved 24 March 2009. ^ Hyatt, Missy (24 March 2009). "Feedback to ROH, March Badness". Wrestling Observer. Retrieved 24 March 2009. ^ Caldwell, James (4 April 2009). "ROH News: Story from Friday night's ROH Title match in Houston". PW Torch. Retrieved 4 April 2009. ^ Meltzer, Dave (4 April 2009). "New world champion is..." The Wrestling Observer. Retrieved 4 April 2009. ^ Aldren, Mike (27 July 2009). "Daily wrestling news & gossip". The Sun. Retrieved 29 July 2009. ^ a b "Nigel McGuinness signs with WWE". Ring of Honor. WrestleView. 4 September 2009. Retrieved 30 March 2010. ^ "Another ROH star close to signing WWE deal". Wrestling Observer/Figure Four Online. 4 September 2009. Retrieved 4 September 2009. ^ Martin, Adam (27 September 2009). "9/26 ROH Results: New York, NY". WrestleView. Retrieved 19 November 2009. ^ Martin, Adam (12 August 2004). "Full NWA TNA PPV Results – 8/11/04 – (New X Division Champion & much more)". WrestleView. Retrieved 8 April 2010. ^ Sibley, Adam (3 May 2007). "Nigel is Crowned". The Sun. Retrieved 19 January 2010. ^ a b "1PW Open Weight Championship History". One Pro Wrestling. Retrieved 27 April 2009. ^ Alvarez, Bryan (5 December 2012). "Dec 5 Observer Radio: Bryan Alvarez and Dave Meltzer talk to Nigel McGuinness about his excellent new documentary, lots of behind-the-scenes notes, reflections on his career, where he goes from here, so much more". Wrestling Observer Newsletter. Retrieved 7 December 2012. ^ Caldwell, James (21 October 2009). "WWE/TNA News: Why WWE did not sign Nigel McGuinness after an initial agreement". PWTorch. Retrieved 29 October 2009. ^ Caldwell, James (20 October 2009). "WWE/TNA/ROH News: Nigel McGuinness reportedly switching major companies after initially signing with WWE". PWTorch. Retrieved 20 October 2009. ^ Wilkenfeld, Daniel (22 October 2009). "WILKENFELD'S TNA IMPACT REPORT 10/22: Ongoing "virtual time" coverage of Spike TV broadcast". PWTorch. Retrieved 23 October 2009. ^ Wilkenfeld, Daniel (29 October 2009). "WILKENFELD'S TNA IMPACT REPORT 10/29: Ongoing "virtual time" coverage of Spike TV broadcast". PWTorch. Retrieved 30 October 2009. ^ Wilkenfeld, Daniel (12 November 2009). "WILKENFELD'S TNA IMPACT REPORT 11/12: Ongoing "virtual time" coverage of Spike TV broadcast". PWTorch. Retrieved 15 November 2009. ^ Caldwell, James (15 November 2009). "CALDWELL'S TNA TURNING POINT PPV REPORT 11/15: Ongoing "virtual time" coverage of A.J. Styles vs. Samoa Joe vs. Daniels". PWTorch. Retrieved 15 November 2009. ^ Caldwell, James (20 December 2009). "CALDWELL'S TNA FINAL RESOLUTION PPV REPORT 12/20: Ongoing "virtual time" coverage of A.J. Styles vs. Daniels, Angle vs. Wolfe". PWTorch. Retrieved 21 December 2009. ^ Keller, Wade (4 January 2010). "Keller's TNA Impact Live Report 1/4: Jeff Hardy, NWO reunion, Hulk Hogan, TNA Knockout Title match, more surprises – ongoing coverage". Pro Wrestling Torch. Retrieved 30 March 2010. ^ Caldwell, James (17 January 2010). "Caldwell's TNA Genesis PPV Report 1/17: Ongoing "virtual time" coverage of A.J. Styles vs. Kurt Angle, Hulk Hogan's TNA PPV debut". Pro Wrestling Torch. Retrieved 29 January 2010. ^ Caldwell, James (14 February 2010). "Caldwell's TNA Against All Odds PPV Report 2/14: Ongoing "virtual time" coverage of A.J. Styles vs. Samoa Joe, Nastys vs. 3D". Pro Wrestling Torch. Retrieved 30 March 2010. ^ Wilkenfeld, Daniel (25 February 2010). "Wilkenfeld's TNA Impact Report 2/25: Ongoing "virtual time" coverage of Spike TV broadcast". Pro Wrestling Torch. Retrieved 26 February 2010. ^ Boutwell, Josh (5 March 2010). "Impact Results – 3/4/10". WrestleView. Retrieved 30 March 2010. ^ Keller, Wade (8 March 2010). "TNA Impact Results 3/8: Keller's live ongoing report covering the historic beginning of Monday Night War II". Pro Wrestling Torch. Retrieved 30 March 2010. ^ Caldwell, James (29 March 2010). "Caldwell's TNA Impact Report 3/29: Ongoing "virtual time" coverage of Spike TV show – cage match with Jeff Hardy, RVD, Wolfpack". Pro Wrestling Torch. Retrieved 30 March 2010. ^ Keller, Wade (5 April 2010). "TNA Impact Results 4/5: Keller's ongoing "virtual time" coverage of Hulk Hogan, Beautiful People, Lockdown hype". Pro Wrestling Torch. Retrieved 6 April 2010. ^ Caldwell, James (26 April 2010). "TNA News: Full details on new Championship Ranking system announced". Pro Wrestling Torch. Retrieved 4 May 2010. ^ Parker, Adam (27 April 2010). "Breaking down the TNA ranking system voting (so far)". Pro Wrestling Insider. Retrieved 4 May 2010. ^ a b Keller, Wade (3 May 2010). "TNA Impact Results 5/3: Keller's ongoing "virtual time" coverage of live show from Orlando". Pro Wrestling Torch. Retrieved 4 May 2010. ^ Keller, Wade (20 May 2010). "TNA Impact results 5/20: Keller's ongoing "virtual time" coverage of show on Spike TV including Top Ten Contenders revealed". Pro Wrestling Torch. Retrieved 13 June 2010. ^ Caldwell, James (13 June 2010). "Caldwell's TNA Slammiversary results 6/13: Ongoing "virtual time" coverage of live PPV – RVD vs. Sting, Hardy & Anderson, "nice surprise"". Pro Wrestling Torch. Retrieved 13 June 2010. ^ Martin, Adam (15 June 2010). "Spoilers: TNA Impact TV tapings for June 17". WrestleView. Retrieved 15 June 2010. ^ a b Caldwell, James (17 June 2010). "Caldwell's TNA Impact results 6/17: Ongoing "virtual time" coverage of Impact on Spike TV". Pro Wrestling Torch. Retrieved 18 June 2010. ^ Martin, Adam (15 July 2010). "Impact Results – 7/15/10". WrestleView. Archived from the original on 19 July 2010. Retrieved 27 July 2010. ^ Keller, Wade (29 July 2010). "Keller's TNA Impact report 7/29: Tommy Dreamer announces new name for ECW faction, Hulk Hogan addresses situation". Pro Wrestling Torch. Retrieved 30 July 2010. ^ Gerweck, Steve (13 July 2010). "Spoilers: TNA Xplosion tapings". WrestleView. Retrieved 7 August 2010. ^ Csonka, Larry (26 July 2010). "TNA Xplosion Taping Results (Spoilers)". 411Mania. Retrieved 7 August 2010. ^ Csonka, Larry (27 July 2010). "Complete TNA Xplosion Taping Results (Spoilers)". 411Mania. Retrieved 7 August 2010. ^ Keller, Wade (26 August 2010). "Keller's TNA Impact report 8/26: Flair promises to take over TNA, Hogan takes control, Dixie's husband comes to her rescue". Pro Wrestling Torch. Retrieved 27 August 2010. ^ Caldwell, James (5 September 2010). "TNA News: TNA confirms line-up change to No Surrender – Wolfe & Magnus off the PPV". Pro Wrestling Torch. Retrieved 7 October 2010. ^ Martin, Adam (14 September 2010). "Report: Wolfe expected to miss some time with TNA". WrestleView. Archived from the original on 4 May 2012. Retrieved 14 September 2010. ^ Russo, Vince (24 December 2014). "Nigel McGuinness Shoot Interview (Approx. 60 Mins) – Vince Russo's VIP Podcast – The Swerve – 25 min mark". pyroandballyhoo.com. Retrieved 24 December 2014. ^ Total Nonstop Action Wrestling (29 October 2010). "TNA Xplosion ep. 318". TNA Xplosion. approx. 1 minutes in. Extreme Sports Channel. Where's Desmond Wolfe? What's going on with London Brawling? What's the issue? I'll tell you. The issue is that Desmond, in an attempt to be a dual athlete like myself, is in London, England, having trials for a very prestigious team, not just any team, he is trying out for Chelsea. ^ Caldwell, James (21 November 2010). "TNA News: TNA president says Desmond Wolfe and popular tag team returning to TV "soon"". Pro Wrestling Torch. Retrieved 23 November 2010. ^ Wilkenfeld, Daniel (16 December 2010). "Wilkenfeld's TNA Impact report 12/16: Complete "virtual time" coverage of Spike TV broadcast". Pro Wrestling Torch. Retrieved 17 December 2010. ^ Martin, Adam (11 December 2010). "Spoilers: Impact tapings for 1/6, New Year's Eve". WrestleView. Retrieved 11 December 2010. ^ Wilkenfeld, Daniel (6 January 2011). "Wilkenfeld's TNA Impact report 1/06: Complete "virtual time" coverage of Spike TV broadcast". Pro Wrestling Torch. Retrieved 6 January 2011. ^ Tedesco, Mike (16 May 2011). "Spoilers: Impact Wrestling for May 19". WrestleView. Retrieved 16 May 2011. ^ Total Nonstop Action Wrestling (24 May 2011). "TNA Xplosion ep. 348". TNA Xplosion. Challenge. ^ Total Nonstop Action Wrestling (21 June 2011). "TNA Xplosion ep. 352". TNA Xplosion. Challenge. ^ Martin, Adam (17 June 2011). "Report: Desmond Wolfe released from TNA". WrestleView. Retrieved 17 June 2011. ^ Meltzer, Dave (17 June 2011). "Fri. update: Barnett & Dusty promos, TNA firing, Update on ROH stars contracts, Biggest show". Wrestling Observer Newsletter. Retrieved 25 June 2011. ^ Martin, Adam (25 October 2011). "Nigel McGuinness also returning in-ring for 2CW". WrestleView. Retrieved 25 October 2011. ^ Martin, Adam (12 November 2011). "Photos: Nigel McGuinness' return to the ring". WrestleView. Retrieved 24 November 2011. ^ "Results". Heartland Wrestling Association. Retrieved 24 November 2011. ^ "MCW Mayhem". Main Event Championship Wrestling. Retrieved 9 December 2011. ^ "New champions!!!!!!!". Fight Club: Pro. Archived from the original on 9 December 2011. Retrieved 9 December 2011. ^ "wXw '11th Anniversary'". Westside Xtreme Wrestling (in German). Retrieved 9 December 2011. ^ "Results from "IPW:UK 7th Anniversary Show"". International Pro Wrestling: United Kingdom. 27 November 2011. Retrieved 9 December 2011. ^ "Tour dates". NigelWrestling.com. Retrieved 26 December 2011. ^ "ROH News: Notes from Saturday's first ROH TV taping under Sinclair Broadcasting (contains spoilers)". Pro Wrestling Torch. 14 August 2011. Retrieved 14 August 2011. ^ Namako, Jason (14 August 2011). "Spoilers: ROH Sinclair TV tapings in Chicago". WrestleView. Retrieved 14 August 2011. ^ Namako, Jason (3 November 2012). "Nigel McGuinness named ROH's new authority figure". WrestleView. Retrieved 3 November 2012. ^ Solomon, Jacob (4 November 2012). "Show results – 11/3 ROH TV taping in Pittsburgh, Pa.: All titles defended, new matchmaker, Final Battle line-up takes shape". Pro Wrestling Torch. Retrieved 3 November 2012. ^ Alvarez, Bryan (7 December 2012). "Friday update: Huge weekend preview, Dave on Rousey vs. Carmouche, UFC fighter KO's self in sauna, Noah update, TNA star besides Velvet re-signs with company, tons more". Wrestling Observer Newsletter. Retrieved 7 December 2012. ^ Martin, Adam (8 December 2012). "Nigel McGuinness reveals reason for his retirement". WrestleView. Retrieved 8 December 2012. ^ Radican, Sean (20 December 2012). "Radican's Take: Nigel McGuinness's "The Last of McGuinness" produces a powerful documentary with an important message". Pro Wrestling Torch. Retrieved 20 December 2012. ^ Johnson, Mike (11 December 2016). "ROH-Nigel McGuinness update". Pro Wrestling Insider. Retrieved 12 December 2016. ^ Murphy, Ryan (15 December 2016). "Nigel McGuinness announced as WWE United Kingdom Championship Tournament co-host". WWE. Retrieved 15 December 2016. ^ Johnson, Mike (15 December 2016). "WWE announces new championship, how first champion will be crowned, former ROH Champion signs with WWE and lots more". Pro Wrestling Insider. Retrieved 15 December 2016. ^ "Nigel McGuinness welcomes baby daughter". WWE. 15 April 2018. Retrieved 26 December 2018. ^ "Pro Wrestling Illustrated (PWI) 500 for 2009". Internet Wrestling Database. Retrieved 26 December 2018. ^ "TNAW World Tag Team Title No. 1 Contendership Tournament". Cagematch. Retrieved 25 May 2013. Wikimedia Commons has media related to Nigel McGuinness.